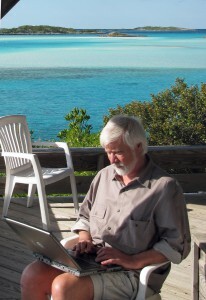 Jerry in his Bahamas office. This whole web site is a work in progress, and I suppose it always will be. The term “In Progress” will at times be questionable but here it is. This part of the web site, “About this blog”, will often have guest authors, but I thought I should kick it off. Many of the guest authors you may know or have heard of and some may be a part of one of the “Adventure” tales that make up the blog. We should all applaud these folks for being brave enough or silly enough to put their thoughts and more, their names on this. The subject of the truthfulness of these stories is bound to come up, so let me set the record straight. As a native born Texan I obtained certain inalienable rights that other folks can’t claim. One of which is “A Texan never lets the truth get in the way of a good story”! However, the intent is to relay these adventures in a truthful manner. For me, this blog is part of my Adventure. For anyone who takes the time to read it, I hope it brings a smile! Thank you for being here and thank you for reading the recent “Adventure” posted.